We special order in R&Rs per your needs. R&R products are machine re-trimmed for parallel edges and with smooth butts sawn at right angles. Primarily used for sidewall applications and are also available with a smooth sanded finish. Available natural or primed. 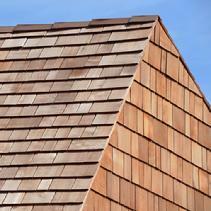 We can special order any size and type of shakes and shingles.